Carry each other's burdens, and in this way you will fulfill the law of Christ. 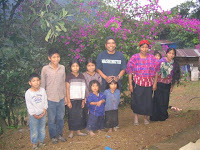 Carlos' wife and many children and his brother's and extended family. For the Martinez family, who have been as family to Carlos and his. For Edwin Martinez as he takes care of all the stuff that needs to be taken care for the family and also for the plantation, it is harvest time and very busy there. For the Group of 16 from Maple Valley, WA that are in the middle of this. That God's light will shine through this dark time, and He will be glorified in the outcome. What do you say if you only have five minutes? update on "I went walking and what did i see..."